South Webster freshman (#15) Bri Claxon had a team high 15 points for the Lady Jeeps in their home loss to Valley Monday night. Valley junior Bre Call had a game high 17 points in the Lady Indians road win over South Webster Monday night. 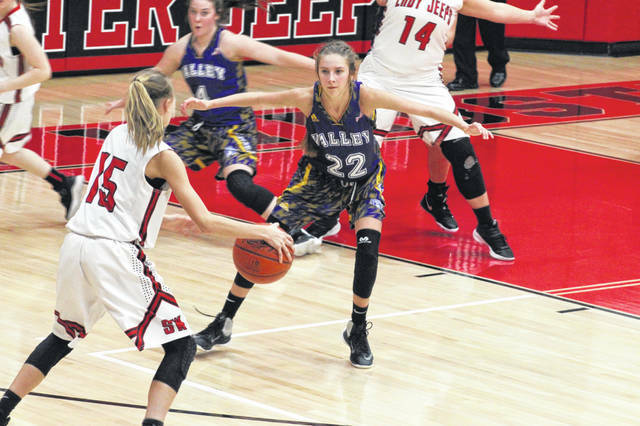 Valley junior Bre Call knew that coming into the fourth quarter with her team holding a five point lead on the road, she would need to lead her team offensively to ensure their victory. Call’s game high 17 points, 11 of which came in the fourth quarter when her team needed her most, was really the straw that broke the Lady Jeeps’ proverbial back in their 52-49 road SOC II win Monday night in South Webster. Senior starter Bailee Day was in constant foul trouble for the Lady Indians and was unable to get any points on the board in her short time on the floor. 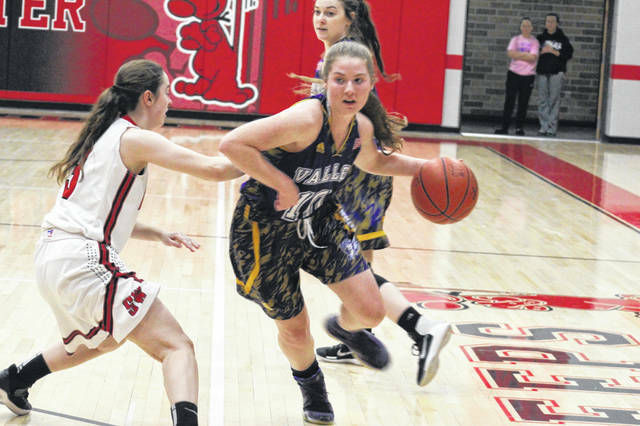 Another starter for Valley, center Hannah Conley, went down with an appearant injury at the start of the second half which in theory would hamper the Lady Indians chances. But as Merritt touched on, his bench stepped up when they were called upon, and helped lead their team to a big road victory. In her sixth man role, Conaway helped contribute the second highest total for the Lady Indians on the night with 12 points which included two massive three’s, while also going 4/7 from the foul line. Nichole Gilliland also played a significant role in the Lady Indians road victory as she had to replace the injured Conley when she went down at the beginning of the second half and was charged with the task of guarding one of the best player’s in the SOC, South Webster’s Maddie Cook. South Webster head coach Ryan Dutiel wasn’t exactly satisfied with his team’s play on Monday night, but says ultimately that responsibility to get his team prepared falls back on him. The leading scorers for the Lady Jeeps included freshman Bri Claxon who added a team high 15 points in the loss, junior Baylee Cox added 14 points, and Cook added 13 to her team’s total. The Lady Indians will travel to Waverly on Thursday to play the 2-0 Lady Tigers in hopes of stealing another road SOC win. As Dutiel noted, the Lady Jeeps will travel to face the Portsmouth West Lady Senators in hopes of grabbing their first SOC win of the season on Thursday.